april 24– discover dance – pacific northwest ballet – more than 600 students performing- cute! and a sneak of coppelia! april 24– highland dance – crossroads – bellevue. not a lot of details, but i have a friend performing- so i’m checking it out! i’d love to hear what some of you are doing this week… as always, i’ve got a list. i’ll be making it to as many of these events as i can- maybe i’ll see you! april 12-18– spa week (uhm, yes please) see an article on nw source for a great list of spas and treatments! april 13– the return of GLEE! set your dvr or hunker down with a slushee and some chips- GLEE is back! another week of great events to get you out and about. here’s a short list of things going on this week… see something i’m missing- send me a note! march 23– jet at the showbox market, tickets are $19, doors are at 7pm, buy tickets here. be sure to check back to n+t day after the show for pictures! march 26-27– blue scholars at showbox market, tickets are $15, doors are at 8pm, buy tickets here. march 26– 6th annual backstage bash ‘when doves fly’ after 3 by dove, tickets have been reduced, you can buy tickets here. another event n+t will be attending with camera in hand. march 26-27– first robotics competition- gotta support kids and science, and i love a good geek event. here’s more info. march 27– prairie home companion, paramount theater, tickets $28-82, 2:45pm, more info here. 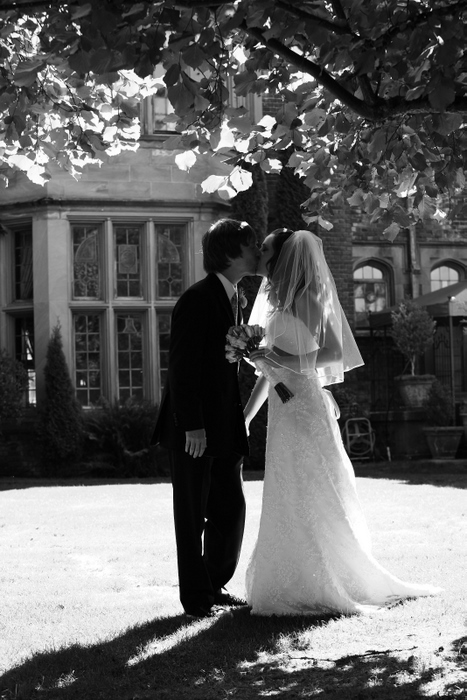 march 27– the bellwethers are hosting another of their eclectic soirees. tickets can be purchased here. march 27– hells bells 10th anniversary show at neumos, tickets $13 adv, doors at 8pm, more info. march 17– james lanman at the jewelbox theater- 10pm, facebook info right here. march 18– nordstrom designer tweet up- bellevue nordstrom, 6-8pm, view the twtvite or search #NordyTU on twitter. march 18– starting the 18th and going through the 28th, PNB’s ‘3 by dove’, here’s some info, check back to n+t for pictures! 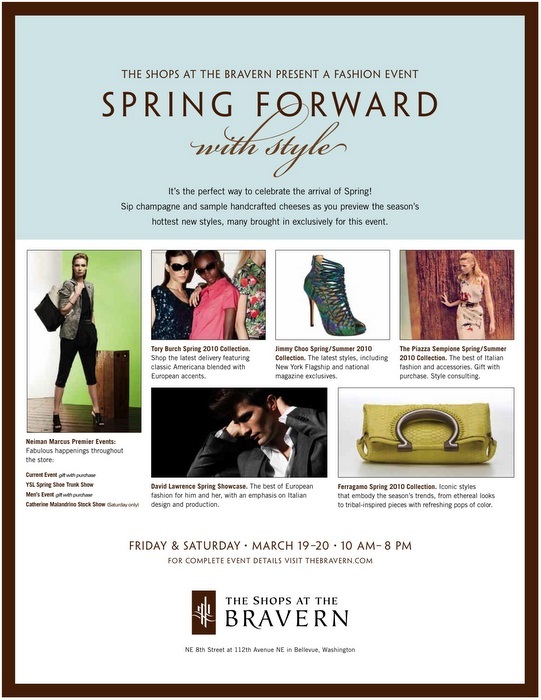 march 19-20– spring forward event at the bravern. all the info you need is right here! march 19– ted leo and the pharmacists, neumos, doors at 8pm, tickets $14 in adv. be sure to check back next week, i’ll have photos from the ballet, and possibly some photos from metric. have a fun week! i don’t often venture to the east side. but i keep hearing about interesting fashion events happening over there, and think i might have to make the pilgrimage. ‘spring forward with style‘ will be going on the 19th and 20th in several shops over at the bravern, get all the info about it right here– featured shops include: neiman’s, jimmy choo, tory burch, piazza sempione, david lawrence and salvatore ferragamo. if you make it over there, mention that you read about it on needleplusthread at any of the concierge desks or booths, and receive a FREE bravern signature tote (i LOVE getting free stuff!). since one of my goals for 2010 involved sipping more champagne, you can bet i’m at least checking out new spring stock at tory burch (go there on the 20th to get a pic snapped by le21eme), and i’m interested to see which stars wore which choo’s to the oscars (apparently they have some collatoral showcasing stars on the red carpet?) and i’ll sip and nibble to my heart’s content. 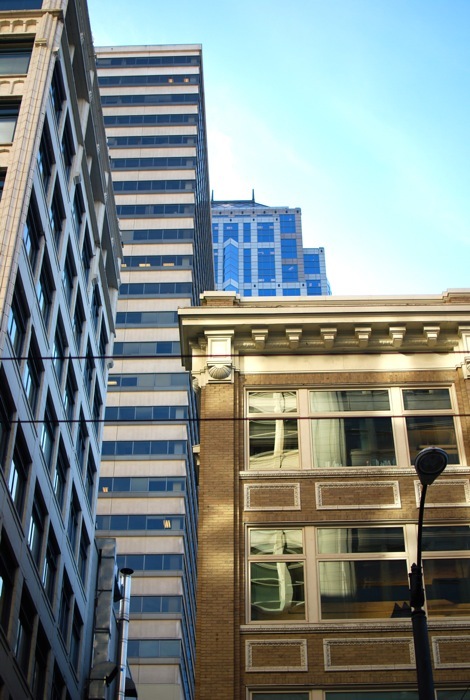 for ongoing info on what’s happening at the bravern, be sure to follow them on facebook, and twitter. dec 3rd-17th (thursdays) – downtown – an improvised christmas carol – have you been to unexpected productions? HI-larious, and their interpretation of a christmas carol is SO FUNNY. i think i went 3 times the first year i found it. they take suggestions from the audience for elements of the story, and it turns a story we’ve all heard a zillion times, into something unexpected, fresh and FUNNY. GO! dec. 4th – downtown – figgy pudding caroling contest – if you’ve never been, it’s worth a stroll through, or stay for the whole thing. i love that they block off the streets and you can wander and listen to all the groups sing. here’s some info about the event. dec 5th – holiday kick off at the sip and ship in ballard – i know there’s music and a percent off, but can’t find my email about it. i LOVE the sip and ship. and they take a lot of stress out of wrapping AND shipping. two things i’m not fond of. dec. 6th – the boutique culture warehouse sale – i went to the one they had end of summer… some great deals from some of your favourite boutiques AND this time they’re doing a clothing swap. here’s the info. dec. 12th – santarchy or santacon… of course they have a facebook page. the best part of santarchy is coming across it randomly. dec. 17th – holiday party at mario’s, their website has all the info. plus i just did a search for where to see the best light decorations, and my favourite, olympic manor is listed in this article– although, i can’t tell how old it is. and just realized it’s written by courtney strand, who i met for the first time at blogmeetblog! more to come, and if you know of something great, email me! i seriously start getting giddy, my ADD kicks into overdrive with all the sparkle, music, parties… baking opportunities. i make christmas music mixes and make my husband nuts with the over-playing of the waitresses ‘christmas song’, i like wearing socks and sliding in the kitchen while gene autry blares, and i make cookies i only ever eat this time of year. since this blog is seattle specific, i wanted to begin to collect all the things i love attending every year. seattle is beautiful at christmas. i love living here, and making new traditions in our city by the sea… i know i’m getting a jump on the christmas stuff, pre-thanksgiving- but… this is what i’m looking forward to, and there it is. if you want to find a list of christmas events, check back and click on inspiration or musings. for the month of december, i’ll make sure it stays at the top. have a happy thanksgiving (we’re doing a small t-day with friends- wii give thanks!- it’s kind of self explanatory…and will involve turkey). hope to see you about town, and as always… i’ll have my camera. p.s. the picture is from last week and involved no editing but cropping. i’m loving the crazy light shift this time of year- although it is making for some tough fashion capturing. dec 3rd-17th (thursdays) – an improvised christmas carol – have you been to unexpected productions? HI-larious, and their interpretation of a christmas carol is SO FUNNY. i think i went 3 times the first year i found it. they take suggestions from the audience for elements of the story, and it turns a story we’ve all heard a zillion times into something unexpected, fresh and funny. GO! dec. 4th – downtown – figgy pudding caroling contest – if you’ve never been, it’s worth a stroll through, or stay for the whole thing. i love that they block off the streets and you can wander and list to all the groups sing. here’s some info about the event.